Aquassure showers come in a large variety of sizes and models to fit every project. Reinforced walls enable easy, secure installation of grab bars and accessories without worrying about finding studs. Pre-leveled pans require no mud-setting and feature steel reinforcement built into the threshold for added strength. Showers come fully blocked and ready to install directly on the studs, with the water barrier built right in. Multi-piece showers come in 3-5 pieces for easy transport through doors and hallways. The side walls have ratcheted snap joint connections for quick, easy install. Single-piece units are also available for new construction. Gel-coat finish makes the showers durable and attractive, yet easy to clean. 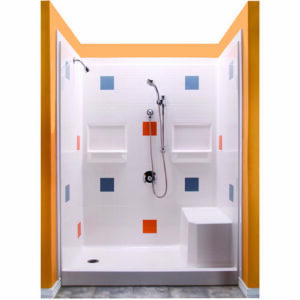 Our full line of showers is specifically engineered to quickly and professionally convert a standard bathing space into an accessible, attractive and safe bathing area. They are made in the United States and are backed by a 30 year limited manufacturer’s warranty. 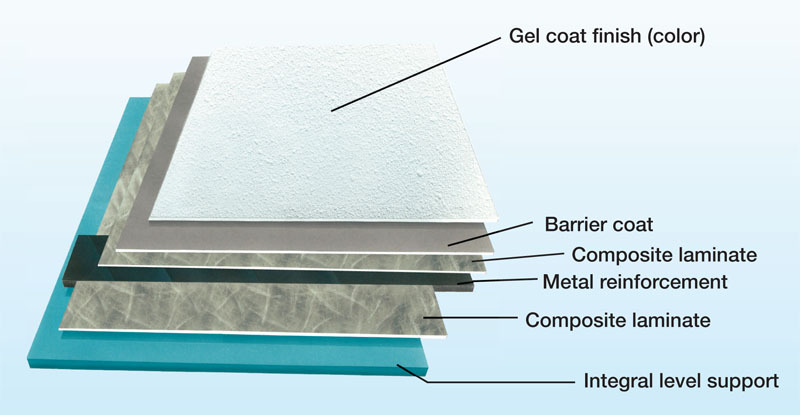 including the composite wall and floor system! Browse through our catalog for technical info, prices and more! 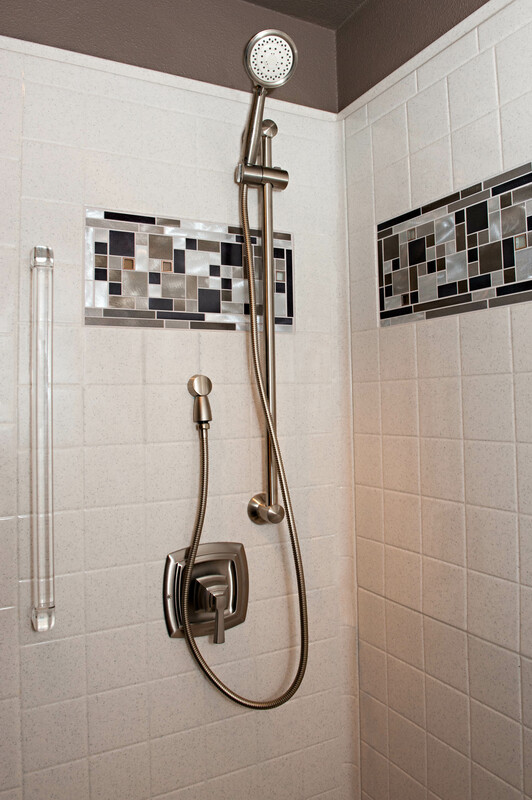 Our showers come in many different configurations to choose from, including: beveled or traditional thresholds; end, center and trench drains; and a variety of sizes and tile-patterns to choose from. Corner units, pans without the walls, and a variety of trim and finishing accessories are also available. All showers come in basic white, but can be upgraded to a selection of beautiful off-white shades. Custom colours such as faux stone and accents in every colour of the rainbow are also available. Click here to download scale diagrams of the differences between thresholds. Traditional Showers range from 3 – 6” in threshold height and are a 90-degree straight T threshold. Some feature built-in seats. 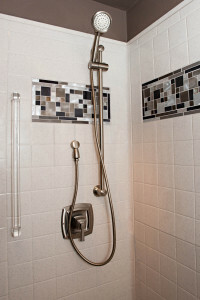 ADA Compliant Showers meet the specifications lined out in the Americans with Disabilities Act. Portable Showers are available as a solution for customers who do not have the ability to renovate their home, but need the accessibility that a barrier free shower can provide. Need it Now Packages are available on some of our most popular models. They are eligible for a speedier shipping time when you order them as a complete basic package of a white shower and full accessories package with no additional products, custom requests or accents. Visit our photo gallery to see completed shower installations! For lifetime use, barrier-free showers can be installed with a semi-permanent threshold that is strong enough to hold a traditional glass door, but can be removed for wheel-in access for future accessibility needs and reinstalled again if you no longer need the roll-in access. Classic tub/shower combos are also available with or without transfer seats, and can be used with bath benches. Click here to browse our bathtubs. We also have a wide variety of shower surrounds systems for use with regular bathtubs, walk-in bathtubs and the ADL Spa slide-in bathtub. These are used in place of a tiled or acrylic surround. Some models feature snap-joint corners. Click here to browse our wall surrounds. We have a wide range of accessories for our showers and all our showers have the option of adding a shower accessory package at a special package price. Our accessory packages include a shower curtain and rod, waterstopper (barrier-free models), padded fold-down seat, shower valve, hand shower and glide bar, and two grab bars. Depending on if the shower is barrier-free, ADA, or traditional, this package may vary. In addition we carry a full range of seats, benches, grab bars, weighted shower curtains, shampoo & soap shelves, towel racks, anti-slip coating, attendant shower curtains, caregiver doors, and other safety devices. Click here to browse our accessories. Showers come in standard white but can be upgraded to a selection of off-whites, as well as every colour of the rainbow via RAL Gelcoat, and faux stone Solid Surface. We can also match most paint samples. Visit our colour chart page to see what is available! Designer showers and pans are now available with tile insets that allow you to insert your own custom tile. 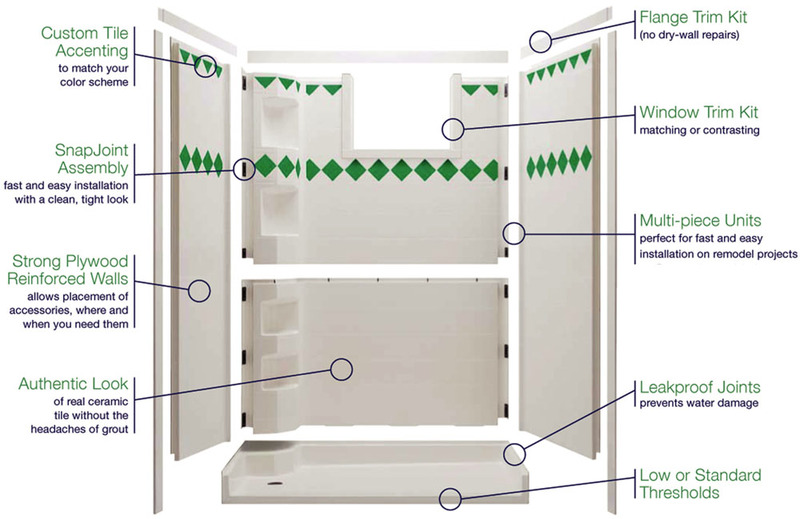 On the left, find out how easy it is to install one of our showers! On the right, learn what it is to have a Lifetime Shower System! Trade pricing is available. Pricing on this website is MSRP and in Canadian dollars. US Customers, please contact us for a quote as exchange rates can make the pricing very different.